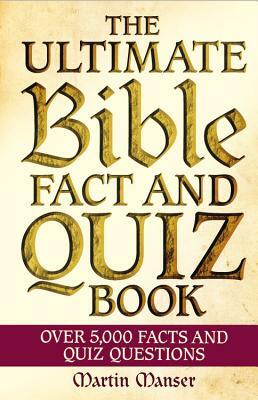 The Ultimate Bible Fact and Quiz Book is a new and exciting way to discover the Bible. It can be used in community and church groups, Sunday School classes, family games and devotions, or simply for entertaining reading. What’s unique about this collection of quizzes and facts is its variety. Topics covered included include Jesus Christ, important Bible characters, significant events, geography, music, food, love, war, money, gardening, animals, crime, punishment, miracles, angels, dreams... the list is virtually endless! The quizzes are designed to challenge every age and ability. Some questions may seem easy, such as, ‘In which town was Jesus born?’ or ‘Who was said to be the wisest King in the Bible?’ Others may be a bit more challenging, like, ‘How old was Joash when he began to reign in Judah?’ or ‘What was the name of King David’s third son?’ With over 4,500 facts and questions, this book will be sure to test your knowledge and make learning about the Bible fun. Martin Manser was born in 1952 in Bromley, Kent. He was educated at Manchester Grammar School and Eltham College. He received a BA Honors degree in linguistics at the conclusion of his studies at the Universities of York, England and Regensburg, Germany. A developing interest in lexicography led him to take up a post as a reference-book editor. Since 1980 he has worked on over 150 reference books with a contemporary appeal. He has also compiled and edited many titles that encourage Bible reading. He also leads training courses on clear writing for, and acts as a consultant with, national and international companies and organizations.